Ray is beginning his sixteenth year as a percussion instructor in public schools. 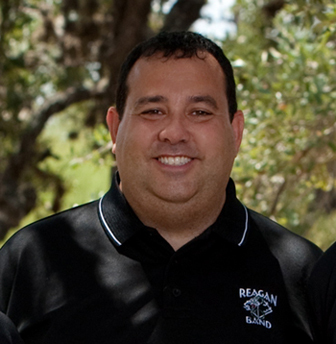 Prior to teaching at Reagan High School in San Antonio Texas, Mr. Ulibarri was the percussion director at Klein Forest high School and Pomona High School in Arvada Colorado. During his tenure with Pomona, the band won an unprecedented 11 State Marching Band Championships. In addition the Percussion ensemble was a two time medalist at the WGI World Championships and perennial ﬁnalist. In 2002-03 Mr. Ulibarri was the percussion instructor of the University of Colorado Golden Buffalo Marching Band. Mr. Ulibarri is currently the former Percussion Arranger for the Crossmen Drum and Bugle Corp and the former caption Head of the Bluecoats Drum and Bugle Corps. He is also the former front ensemble arranger and caption head of the Blue Knights World Percussion Ensemble. Both groups are recognized as innovators in the world of percussion and have placed in the top three in the world. As an arranger Ray has arranged music to be played in two Tournament of Roses Parades. His custom percussion arrangements are in demand throughout the country and he is a freelance composer. Mr. Ulibarri has studied with Ralph Hardimon Gray Barrier, Doug Walter Doug Rosener, Amy Smith and Mark Foster. He is endorsed by Innovative Percussion, Evans, Zildjian and Yamaha. Ray Ulibarri is an active music adjudicator and clinician throughout the country.